This dehydrated food is quite delicious. If it seems pricey at >$4 for 85 grams it represents nearly half a kg of bacon, but it keeps without any refrigeration and will add some zap to an otherwise fairly bland pasta meal for example (particularly if you add some Kraft Cheddar cheese as well – which also keeps without refrigeration indefinitely). It is not at all salty – unlike the Kraft cheese. Available Coles. PS: I found the empty container makes an excellent ultralight glasses case. 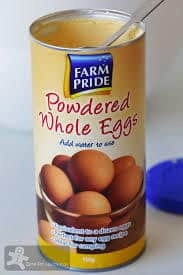 This would go well as an addition to Farm Pride’s excellent Powdered Eggs (available in the cake aisle in supermarkets). These reconstitute as scrambled eggs really well – the addition of a little powdered milk adds a nice touch. 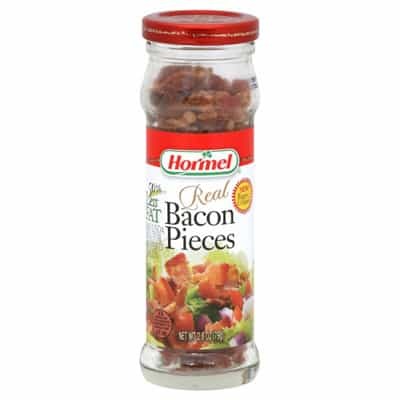 I would just stir some of this dehydrated bacon into the mix and serve with an accompaniment of Continental mash for a hearty breakfast, for example. Suggestion: Try a search for ‘food’ in the Search bar at the top right of the page. I have posted many ideas there over time. Tip: The empty jar weighs only 33 grams (inc lid) and makes an excellent ultralight uncrushable glasses case.